There are so many imitations that the dish has kind of reinvented itself from the original at Manale’s. The main ingredients in the sauce of most versions are usually: Butter, Rosemary, Garlic, Black Pepper, and Worcestershire. I’ve been wanting to post this dish for quite awhile, but I haven’t been able to locate head on shrimp until now. The fatty red substance in the shrimp heads, akin to the lobster’s tamale, is the key to your sauces flavor for this dish. The dish made with head off shrimp will be very good, but true flavor authenticity lies in the shrimp heads. I found my head-on shrimp in an Asian specialty store. Look long and hard like I have. You will find them and they will be worth every last bite. Melt 2 Tbsp of the butter in a large cast iron skillet over medium heat. Add the garlic and saute until slightly browned. Add the fresh herbs and cook for 2 minutes. Deglaze with the beer, reduce by half. Add the lemon juice, Worcestershire, hot sauce, black pepper, kosher salt, cayenne pepper and the shrimp, tossing to coat well. Transfer the shrimp and sauce to a baking dish where the shrimp can bake in the sauce in a single layer. Place into the preheated oven for 10-15 minutes. Do not over cook the shrimp! Serve in a large bowl with the chopped parley, your favorite beer, and lots of fresh French Bread for dipping in the sauce. Be sure to check out my ever growing Index of Creole & Cajun Recipes! Are you sure that’s enough for two? Looks like a single serve to me, eheheh. Poor you, finding it difficult to locate head on shrimp, even in cold Melbourne there are plenty of places to get them. Thank you for the advice on where to aquire heads-on shrimp. 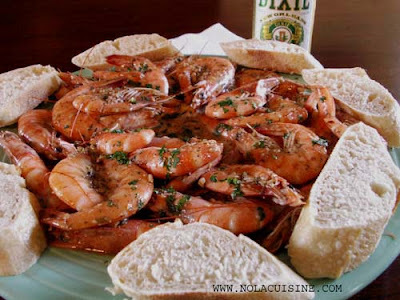 I have Proudhomme’s version of this dish and look forward to this rendition…hmmmm–shrimp,beer, bread…yum! I am excited to try this – on our last visit to New Orleans we ate at Pascal’s and these were the best shrimp we had ever eaten – thanks for the recipe. Is there anyway you can set up these recipe’s in printable form so we don’t have to print two or three pages of other stuff. Sara – I need to work on a printable version, I’ve been meaning to do that for quite awhile now. In the meantime though, You could highlight and copy the text you want and paste it into a word document and print it that way. I will definately work on making this site more printer friendly, thanks for the suggestion. Danno, if I’m not mistaken, you forgot to say add the remaining butter. Frank Davis, a local color guy on tv does a variation where you use half margarine and half butter. In your serving the bowl you mix bread crumbs and parmesan and then laddle the shrimp and butter combo on top. It makes for a really big mess when you peel the shrimp as the crumbs and cheese get all over your fingers. Anyway, love the site, keep up the good work. Great recipe–looks very similar to one I had and lost years ago from the chef at the Old Nawlins Cookery in, well, New Orleans. I can hardly wait to try it. Good tip also on where to get intact shrimp! Enjoying your site very much. I gotta say; I’ve spent the last two days cutting pasting and printing your recipes for a personal cook book. I look forward to trying different variations of this as well as all the rest of your recipes. Great site – thanks for sharing your culinary art. Thank you, thank you for your wonderful recipies. the shrimp ettouffe is to die for. Don’t stop what you do. The best barbecue shrimp I’ve ever tasted was at the Alpine restaurant in New Orleans. They give away their recipe. I also want to comment on the heads-on shrimp. I wonder if the requirement that you *have* to find the heads-on shrimp is just passed on without question. I can’t tell the difference, and I challenge anyone else if they can tell the difference. A professional test was done and most of the testers could tell little or no difference. Just wondering. I had the barbecue shrimp at Court of Two Sisters twice last time I was in New Orleans (May 08) and I think it’s the very best — it was so delicious and different than any I’d had before. I can’t seem to find the recipe — even the one in the restaurant’s cookbook doesn’t seem right at all. I mean, I am certain there was cane syrup in the mix, along with worcestershire, butter, and more, all which turned into a delectable mopping sauce that never will be forgotten. Any clues on how to get the true recipe??? Use the heads-on shimp if you can find them. The juices from the heads add to the flavor of the sauce when in the oven. But this will work with de-headed shrimp. Very delicious recipe. I added 1/2 orange squeezed and orange slices on top in the oven in addition to the lemons. Next time, I’m reducing the oven time to around 10 mins. Mine were almost overdone at 15. When does the rest of the butter go in? I made this last night, and it was great! I winged the butter issue, and added along with the lemon juice and other liquids. I’ve done the Prudhomme recipe before, which is much hotter. This was a nice and different taste, more black pepper. My Michigan friends even said it was not too hot! Thanks for the great website and your recipes Danno! thanks Danno, i had been looking for a po Boy recipe and ended up checking out sausage making which interestingly enough is not too difficult .Im of Spanish descent and felt a connection to LA cooking and culture.I shall return !! My wife and I are NO ex-pats and I just made this dish for New Years Eve dinner. It was outstanding (and by the way my wife is looking at me she liked it to). Thank you Danno! My only critique – and it is solely a matter of taste – is that I am going to cut the salt by half the next time I make this. Though the flavor is absolutely authentic as-is, I want to be able to serve this to my in-laws – both of whom have high blood pressure. I also have a question for Danno. Back when my wife and I lived in NO her landlady (this was before we were married) made BBQ shrimp that was outstanding, but different from this recipe. I know it included ketchup (maybe she didn’t have tomato paste?) and had a thicker, redish, opaque sauce. I would love to reproduce that and wondered if you had a recipe for that. ps. I put the rest of the butter in with the cayenne/hot sauce etc., but before the shrimp so it had time to melt. Worked great and there was plenty of sauce for dipping (we killed an entire baguette while reminiscing). We had these for Easter Dinner yesterday. Omitted all but 1/4 tsp of salt and it was FABULOUS! Thanks for all the recipes Danno! When does one add remaining butter? Here’s one for you: Do you have any suggestions on what to do with all that leftover buttery goodness (assuming you haven’t mopped it all up with French bread of course!)? There has to be a recipe I could use this seasoned butter in… Thoughts anyone? I’ve been thinking about a menuire sauce for fish. Any reason this would not work?